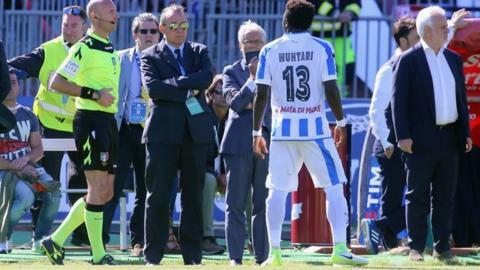 Italian football’s reputation around the world has been damaged by the Sulley Muntari affair, the Italian Football Federation’s anti-racism advisor says. Fiona May said the decision to uphold the Pescara midfielder’s punishment forprotesting against racism while taking no action against fans had “sent a bad message”. She added she would strike in protest if she were a player. “I’m frustrated and shocked,” May said. BBC football pundit Garth Crooks – a trustee of anti-discrimination organisation Kick It Out – has called for Italy’s players to go on strike in protest at Muntari’s treatment and the the lack of punishment for the fans responsible. 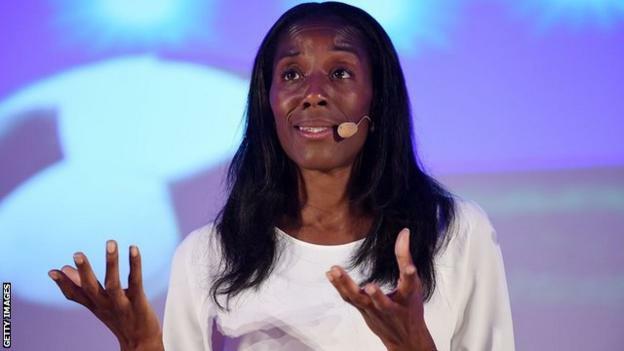 “I would say all players should consider it, to show solidarity,” she told the BBC World Service World Football show – though she stressed she was speaking hypothetically. Muntari was booked for complaining to the referee about abuse he received from some Cagliari fans and received a second yellow card for leaving the pitch without permission. A Serie A disciplinary committee upheld his punishment but said it could not punish the fans as only “approximately 10” were involved in the racist chants – not enough to trigger action under its own guidelines. May said the panel was wrong to follow its guidelines so strictly in this case and asked: “You can’t put a number on how somebody can abuse a player on the pitch. How can somebody put a number on it? She was also critical of referee Daniele Minelli, and said he should have “stopped the game and listened”. May added: “Football is a global sport and I said to the FIGC president ‘this is not helping the image of Italian football whatsoever’. 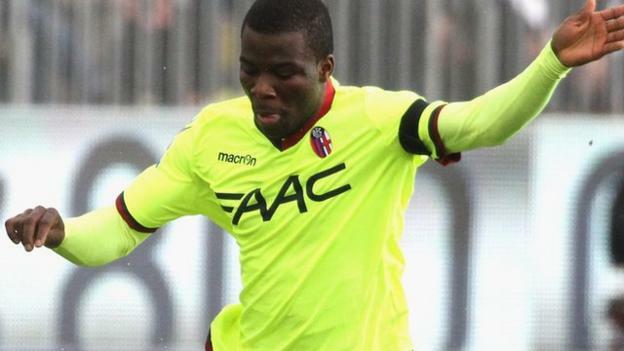 Bologna and Ghana midfielder Godfred Donsah has said is “100%” willing to go on strike to show solidarity with ex-Portsmouth and Inter Milan man Muntari. May admitted she did not think many would heed the call to strike but believes the outcry means there will “most definitely be a change”.